This article is about the Ukrainian parliament. For the Crimean regional legislature, see Verkhovna Rada of Crimea. Due to the Russian military intervention in Ukraine (2014-present) and the annexation of Crimea, only 423 of the parliament's 450 seats were elected in the last election. The Verkhovna Rada was transformed out of the system of republican representative body known in the Soviet Union as Supreme Soviet (Supreme Council) that was first established back in 1938 as a type of legislature of the Ukrainian SSR after the reorganization of the Central Executive Committee of the Ukrainian SSR. The 12th convocation of the Supreme Council of the Ukrainian SSR (elected in 1990) issued the Declaration of Independence of Ukraine, introduced elements of a market economy and political liberalization, and officially changed the numeration of its sessions, proclaiming itself the first convocation of the "Verkhovna Rada of Ukraine". The current parliament is the eighth convocation. Because of the War in Donbass and the unilateral annexation of Crimea by Russia, elections for the constituencies situated in Donbass and Crimea were not held in the 2014 and 2019 elections; hence the current composition of the Verkhovna Rada consists of 423 deputies. The name Rada (Ukrainian: Рада) means "council", "rede". The institution originated in the time of Kievan Rus', and then represented a council of boyars and of higher clergy. In the 17th and 18th centuries the Dnieper Cossacks used the term to refer to the meetings where major decisions were made; the Cossacks elected new councils by popular vote. The Ukrainian People's Republic between 17 March 1917 and 29 April 1918 had a Central Rada. The West Ukrainian People's Republic and the Ukrainian government-in-exile each had a UNRada (Ukrainian National Rada). Verkhovna, the feminine form of the adjective "верховний" meaning supreme, derives from the Ukrainian word "верх" meaning "top". Another name, used less often, is the Parliament of Ukraine (Ukrainian: Парламент України). The Supreme Council of the Ukrainian SSR replaced the Central Executive Committee of the Ukrainian SSR that was elected by All-Ukrainian Congress of Soviets and was a type of legislative authority of Soviet Ukraine according to the 1937 Constitution of the Ukrainian SSR. The All-Ukrainian Congress of Soviets had already been renamed the Supreme Council in 1927. The Congress of Soviets was initiated by the Central Executive Committee of Ukraine. The last chairman of the committee was Hryhoriy Petrovsky (also known as Grigoriy Petrovskiy in Russian transliteration). The first elections to the Supreme Council of the Ukrainian SSR took place on 26 June 1938. The first session of the parliament took place in Kiev from 25 July through to 28 July 1938. The first Chairman of the council was Mykhailo Burmystenko who later died during World War II. In 1938, a presidium of the council was created that was led by Leonid Korniyets. During the war the presidium was evacuated to the city of Saratov in the Russian SFSR. On 29 June 1943, the presidium issued an order postponing elections for the new convocation for one year while extending the first convocation. On 8 January 1944, the Cabinet of Ministers of the Ukrainian SSR in agreement with the Communist Party decided to relocate the Presidium of the Supreme Council from Kharkiv to Kiev. New elections were scheduled for 9 February 1947 for the Council. Yulia Tymoshenko, is appointed Prime Minister of Ukraine in the Rada on 4 February 2005. Until 24 August 1991, Verkhovna Rada kept the name Supreme Council of the Ukrainian SSR. The first partially free elections to the Verkhovna Rada and local councils of people's deputies were held on 4 March 1990. Although the Communist Party still remained in control, a "Democratic Bloc" was formed by numerous parties, including People's Movement of Ukraine (Rukh), Helsinki Watch Committee of Ukraine, Party of Greens of Ukraine, and many others. The twelfth convocation of the Supreme Council of the Ukrainian SSR issued the Declaration of State Sovereignty of Ukraine on 16 July 1990, and declared Ukrainian independence on 24 August 1991, at approximately 6 p.m. local time. At the time, the Chairman of the Verkhovna Rada was Leonid Kravchuk. The Act of Ukrainian Independence was overwhelmingly supported in a national referendum held on 1 December 1991. On 12 September 1991 the parliament adopted the law "On Legal Succession of Ukraine". Thus, the VR became the Supreme Council of Ukraine. The Constitution of Ukraine was adopted by the thirteenth convocation of the Verkhovna Rada on 28 June 1996, at approximately 9 a.m. local time. The parliament's fourteenth convocation officially changed the numbering of the convocations proclaiming itself the third (democratic and independent) convocation of the Verkhovna Rada. After the Orange Revolution, constitutional amendments were adopted in December 2004, by the fourth (fifteenth) convocation of the Verkhovna Rada. On 1 October 2010 the Constitutional Court of Ukraine overturned the 2004 Amendments, considering them unconstitutional. On 21 February 2014, parliament reinstated the December 2004 amendments to the constitution. In 2017 and 2018, the website of the Verkovna Rada was the most popular among all websites of the parliaments of UN member states. The Verkhovna Rada meets in a neo-classical building on Kiev's vulytsia Mykhaila Hrushevskoho (Mykhaila Hrushevsky Street) and Ploshcha Konstytutsii (Constitution Square). The building adjoins Mariinsky Park and the 18th century Mariyinsky Palace, designed by Bartolomeo Rastrelli, which serves as the official residence of the President of Ukraine. After the transfer of the capital of the Ukrainian SSR from Kharkiv to Kiev in 1934, a whole set of government buildings was planned for the city. In 1936, a contest for the construction of the new parliament building was won by architect Volodymyr Zabolotny. The original building was constructed from 1936–38. Having been destroyed in the Second World War, the building was reconstructed from 1945-1947, with the rebuilt glass dome one metre higher than the original. The Verkhovna Rada is the sole body of legislative power in Ukraine. The parliament determines the principles of domestic and foreign policy, introduces amendments to the Constitution of Ukraine, adopts laws, approves the state budget, designates elections for the President of Ukraine, impeaches the president, declares war and peace, appoints the Prime Minister of Ukraine, appoints or confirms certain officials, appoints one-third of the Constitutional Court of Ukraine, ratifies and denounces international treaties, and exercises certain control functions. In Ukraine there are no requirements for the minimum number of signatures (of deputies) to register a bill. In general the parliament adopts about 200 bills per year. 5.5 bills are registered daily in parliament. As a result of this in the spring of 2019 parliament had more than 10 thousand registered and under consideration bills it had yet to debate. All procedural regulations are contained in the Law on Regulations of the Verkhovna Rada of Ukraine. The latest version of the document was adopted on 16 December 2012, in which through the initiative of the President of Ukraine amendments were made concerning registration and voting by parliamentarians. 2012 became a year of numerous changes in regards to the document, among which were changes to the election of the Chairman. Bills are usually considered following the procedure of three readings; the President of Ukraine must sign a law before it can be officially promulgated. Until 2017 the parliament appointed and dismissed judges from their posts and permitted detention or arrest of judges (those powers were transferred to the Supreme Council of Justice). The Verkhovna Rada is a unicameral legislature with 450 people's deputies (Ukrainian: народний депутат) elected on the basis of equal and direct universal suffrage through a secret ballot. All members of parliament are grouped in parliamentary factions and groups. Members of parliament who were elected from a certain party list are not necessarily members of that party. Parties that break the 5% electoral threshold form factions in the parliament. The formation of official parliamentary factions is regulated by the Verkhovna Rada's rules and procedures. Only 15 or more deputies may form a parliamentary faction and a MP may be a member of only one faction at a time. The chairman and his two vice-Chairman may not be the heads of factions. Under current parliamentary rules a faction of non-partisan politicians can not be smaller than the smallest faction of a political party. Deputies who are expelled from factions or decide to leave them become individual lawmakers; individual deputies are allowed to unite into parliamentary groups of people's deputies that again have at least 15 deputies. Several influential parties have been founded after originally being formed as a faction in the Verkhovna Rada, for example, the Party of Regions, All-Ukrainian Union "Fatherland" and Labour Ukraine. Each parliamentary faction or group appoints a leader. Since the Imperative mandate provisions of the Ukrainian constitution came into effect again in February 2014 a political party can withdraw a parliamentary mandate if one of his MPs leaves its parliamentary faction. MPs who defected from one faction to another were known as "Tushky" a derogatory name meaning "carcass". The term was applied to deputies allegedly bribed to switch factions. Since the 2014 parliamentary election women made up 11.1% of the parliament; setting a record for Ukraine. After the 2012 parliamentary election women made up 10% of the parliament; in 2010 they made up 8.5%. The EU average for female representation in national legislatures by comparison is 25%. 14 deputies missed all 51 sessions of parliament in 2010. On 27 November 2014 five factions and two parliamentary groups where formed (at the opening session of the new parliament formed after the 2014 Ukrainian parliamentary election). ^ Revival was briefly called Economic Development in 2014. It was also a parliamentary group like People's Will until 2015. ^ People's Will is a parliamentary group. Parliamentary groups consist of non-partisan deputies or representatives of parties that did not overcome election threshold (i.e. Svoboda, Strong Ukraine, etc.). ^ The People's Will deputy group in previous convocation was known as Sovereign European Ukraine. ^ Parties that did not pass the 5% threshold of the 2014 Ukrainian parliamentary election, Svoboda (7 seats), Right Sector (1 seat), Strong Ukraine (1 seat), Volia (1 seat), and Zastup (1 seat) are part of non-affiliated. After the 17 July 2016 constituency mid-term elections the parties UKROP and Our Land joined them. ^ 30% of the Petro Poroshenko Bloc election list was filled by members of the Ukrainian Democratic Alliance for Reform (UDAR), which did not participate in the 2014 election independently. UDAR participated in the 2012 election, consisting of a faction of 41 deputies in the previous convocation. ^ People's Front is a September 2014 split off from Fatherland; many current members of the People's Front were members of the Fatherland faction of the previous convocation. ^ The Opposition Bloc consists mainly of former members of former President Yanukovych's Party of Regions, which formed the largest caucus after the 2012 election with 185 deputies, although after the removal of Yanukovych and the 2014 Ukrainian revolution, the caucus consisted of only 78 members. ^ The addition of these four deputies made it possible for Petro Poroshenko Bloc and People's Front to form a government without additional parties. 2002–2006 Viktor Yushchenko Bloc "Our Ukraine"
2014– Petro Poroshenko Bloc "Solidarity"
For all political issues in the parliament such as party switching and piano voting, see People's Deputy of Ukraine. Members of the Verkhovna Rada are known officially as People's deputies of Ukraine. According to the "Law on elections of national deputies of Ukraine", a citizen of Ukraine may become a People's Deputy if he or she has, on the day of election, a) reached 21 years of age; b) political franchise; c) resided in Ukraine for the last five years. Deputies have the right to free transportation, free use of the hall of official delegations, free housing, free medical services and free vacations at health spas. Each deputy is allowed to have up to 31 assistants-consultants four out of them are allowed to be admitted into the Secretariat of the Verkhovna Rada. The Ukrainian President, Prime Minister, members of the government and deputies all have parliamentary immunity and agents of law enforcement are prohibited from searching their homes or following them. During the Orange Revolution and the campaign for the 2007 parliamentary election Party of Regions, OU-PSD and BYuT all promised to strip lawmakers of their parliamentary immunity. In June 2008 the parliament failed to adopt the Bill on restriction of privileges for deputies and introduction of imperative mandate. 192 people's deputies voted "for" the bill submitted by the BYuT faction out of 436 deputies registered in the plenary hall. The factions of the opposition Party of Regions, as well as the CPU and the Lytvyn Bloc voted against, the OU-PSD faction voted partially "for" and the BYUT faction voted unanimously "for". A proposal to send the bill for the first reading for a second time also did not find support. In May 2009 the second Tymoshenko Government approved a bill amending the Law on the status of a people's deputy of Ukraine, this bill reduced certain privileges for incumbent and former deputies. The parliament canceled some benefits and payments to lawmakers in December 2011. Deputies possess full legal immunity during their term of office. In cases of egregious malfeasance, the Prosecutor General of Ukraine or the Head of the Supreme Court of Ukraine can request that a deputy's immunity be revoked; the decision whether to revoke is up to the Verkhovna Rada. Deputies can also tender their resignation themselves. As of 25 March 2010, no deputy's immunity or their privileges were revoked. Individual deputies can be stripped of their immunity if a bill to strip their rights is passed by the Verkhovna Rada. Deputy's absence from parliamentary meetings is being countered by withholding salary. Over the years several local millionaires have been members of the Rada. “ Присягаю на вірність Україні. Зобов'язуюсь усіма своїми діями боронити суверенітет і незалежність України, дбати про благо Вітчизни і добробут Українського народу. “ I swear allegiance to Ukraine. I commit myself with all my deeds to protect the sovereignty and independence of Ukraine, to provide for the good of the Motherland and for the welfare of the Ukrainian people. Current speaker of the Rada, Andriy Parubiy. The Verkhovna Rada elects from among its ranks a Chairman (Speaker; Ukrainian: Голова Верховної Ради), a First Deputy Chairman, and a Deputy Chairman. Before the Chairman of a newly convoked Rada is elected, parliamentary sessions are presided over by members of a temporary presidium of the first session (Ukrainian: тимчасова президія першої сесії). The temporary presidium is composed of five deputies, representing the four largest parliamentary fractions plus the chairman of a preparatory deputy group of the first parliamentary session, however the Rada may enact an ad hoc deviation from this composition rule. The Chairman presides over parliamentary sessions, signs bills and sends them to the President for promulgation, signs and promulgates parliamentary acts (other than bills), organises staff work, etc. The Chairman is also empowered to call special sessions of parliament, enact bills vetoed by the President when the Verkhovna Rada votes to overturn a veto by a two-thirds majority, and participate in meetings of the National Security and Defence Council. In circumstances where the post of President of Ukraine becomes vacant, the Chairman of the Rada becomes acting head of state with limited authority. The Chairman in duties of the President may dissolve parliament, appoint or submit for parliamentary approval candidates for key official posts, grant military ranks or state orders, and exercise the right of pardon. The Constitution and Ukrainian legislation contain no provision for presidential succession in cases where the posts of President and Chairman of the Rada are vacant simultaneously. The Presidium of the Verkhovna Rada is a collective name that was adapted for the Chairman and his or her deputies out of tradition. Before the collapse of the Soviet Union, it was an official office that was elected at the first session of each convocation of the Supreme Soviet. Originally it consisted of a chairman, the chairman's two deputies, a secretary, and 19 additional members. Later compositions of the Presidium changed. The Presidium was regulated by Section 106 of the 1978 Constitution of the Ukrainian SSR. Since independence the institution has been discontinued, but the term is used for the leadership of parliament that includes the current Chairman and his or her deputies and may include faction leaders. The first session of every newly elected parliament is headed by a temporary presidium that consists of six members of parliament according to Article 18 of the Regulations of the Verkhovna Rada. One of the most important sessions of the parliament is the first session of each newly elected parliament. The preparation for the session is conducted by the Preparation deputy group with support from the Office of the Verkhovna Rada. The formation of the group out of the newly elected People's Deputies is conducted by the Chairman of the previous convocation or his/her deputy chairpersons (Article 13, Regulations of the Verkhovna Rada). The group elects its own chairperson, his or her deputy and a secretary on principles for establishing the temporary special commission. The group terminates its activity with establishment of parliamentary committees. Before the opening of the first session of each newly elected parliament, all newly elected People's Deputies of Ukraine are gathered for a special ceremonial meeting to take the oath of office (article 14, Regulations of the Verkhovna Rada). An Invitation to take the oath is given by the Chairperson of the previous convocation who grants the leading word to the oldest member of the parliament who asks the members of parliament to rise and reads the oath out-loud. Every member of parliament signs a copy of the oath that is held in the archives of the Verkhovna Rada. The plenary meetings of the first session review the following matters: formation of the provisional presidium of the first session, establishment and registration of the factions, the situation concerning legislation pending before parliament with the Chairman of the previous convocation, election of the Counting Commission, election of the Chairman, election of the Chairman's deputies, hearing of extraordinary messages on domestic and foreign affairs by the President of Ukraine, hearing and discussion of the Preparation deputy group report, about committees, about Conciliation board of deputy factions in the Verkhovna Rada, about media coverage of the work of the Verkhovna Rada. The Office of the Verkhovna Rada is an internal supporting department of the Verkhovna Rada that provides organizational, legal, social, analytical and other support to parliament, its other departments and members of the parliament. The Office is apolitical in its role, and exists mainly to provide secretarial help. Before the first session of each newly elected parliament the Office provides to members of parliament various documents among which are copies of the Constitution of Ukraine, the Regulations of the Verkhovna Rada, the official results of election from the Central Election Commission of Ukraine, the Law of Ukraine on the status of People's Deputies, among others (Article 12, Regulations of the Verkhovna Rada). The Office of the Ombudsman at the Verkhovna Rada was established in 1998 and was led by Nina Karpachova until 2012. The Office has its own secretariat and advisory council. The current Ombudsman is Valeriya Lutkovska who replaced Karpachova in 2012. The Verkhovna Rada establishes parliamentary committees composed of various deputies. On 4 December 2014 the current parliament formed 27 committees and 2 special control commissions. The previous parliament (2012-2014) had 29 committees and an ad hoc supervisory board. The sixth session of the Rada (2007–2012) had 28 committees, including the Budget Committee, the Special Control Commission of the Verkhovna Rada on Privatization and the Committee on Transportation and Communications. There are no permanent or standing committees, instead, committees are reformed from one convocation to another. One of the most significant for the work of the Verkhovna Rada is the Budget Committee . Members of the Verkhovna Rada are permitted to create temporary investigative commissions. To create such a commission requires one third of the constitutional composition of parliament, 150 members. Before a draft on creation of such a commission may be scheduled for voting, it has to be approved by a relevant committee, the Committee on Regulations, deputy ethics, and ensuring the work of the Verkhovna Rada. Brawls are not unusual in the Ukrainian parliament. On several occasions work in parliament is blocked by sit-ins by various parties (usually for a couple of days; but in 2008 from 18 January till 6 March and in February 2013 for 17 days). In 2000 and on 4 April 2013 the parliament split into two and held two sessions on two different premises. A microphone throwing championship among MPs, organized by the Kiev independent media trade union, was held outside the building of the Verkhovna Rada on Friday, 11 September 2009 in response to an incident on 1 September 2009 when a communist MP snatched a microphone from a STB reporter and threw it downstairs. Several MPs participated. A noticeable incident was the disorder of 27 April 2010, after the parliament ratified a treaty that extended the Russian Black Sea Fleet lease in the Crimean port of Sevastopol until 2042, when Chairman Volodymyr Lytvyn had to be shielded with umbrellas as he was pelted with eggs, while smoke bombs exploded and politicians brawled. Another major incident occurred on 16 December 2010 when several Rada members were admitted to hospital after Party of Regions politicians stormed the parliament podium, which was occupied by the Bloc Yulia Tymoshenko faction. On 12 December 2012, an all-out scuffle broke out in Parliament, as Batkivshchyna party members attempted to prevent the swearing in of two members who had left the party. (This was the Parliament's first session following the October 2012 election.) The same day members of the All-Ukrainian Union "Svoboda" removed the fence around the Verkhovna Rada that was installed early October 2012. The speaker of the parliament Volodymyr Rybak promised to review the incident of the fence removal. The fence is not accounted as the property of parliament nor the city of Kiev. Rybak noted that the matter might require a review within a special designated committee. From the parliamentary election of 28 October 2012 till the first months of 2013 parliamentary work was virtually paralyzed because the opposition (UDAR, Fatherland, Svoboda, others) blocked the podium and Chairman's seat on various days. On 31 August 2015, a policeman on leave threw a hand grenade towards the lines of law enforcement cordoning the Rada building from a riot. The grenade exploded behind the lines. Three members of the National Guard died and up to ninety other soldiers and police officers, as well as several journalists, were wounded during the incident. Following the riot more than 140 people, including protesters were hospitalized. Ukraine was accepted as a full member of the Parliamentary Assembly of the Council of Europe (PACE) in 1995. It is represented there by the parliamentary delegation of the Verkhovna Rada consisting of 12 representatives including a chairperson of the delegation, a vice-chairperson and their 12 substitutes; in total, 24 members. The Ukrainian delegation also has its own permanent secretariat of four members that assist in the inter-parliamentary relationships between the PACE and the Verkhovna Rada. For the full list of members, refer to the PACE main website at assembly.coe.int. 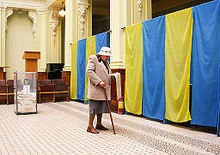 Political developments in Ukraine have led to repeated changes in the electoral system used for parliamentary elections. Each convocation of the Verkhovna Rada has been elected under a different set of laws gradually evolving from the purely majoritarian scheme inherited from the Soviet era to a purely proportional scheme, effective from 2006 until 2010. In the 1990 and 1994 elections, all 450 MPs were elected in single-member districts. Ukraine was therefore divided at the time into 450 electoral districts. Each district sent one member to parliament. In order to win a seat, a candidate needed more than 50% of the votes. If no candidate had 50%, then the two leading candidates participated in a run-off vote. In the 1998 and 2002 elections, 225 MPs were elected in single-member districts as earlier (with the exception that the candidate needed only a simple majority to win). The remaining 225 MPs were elected on a proportional basis. These seats were divided between the parties who passed a 4% electoral threshold. In the 2006 and 2007 elections, all deputies were elected on a proportional basis. All seats were divided between the parties who passed a 3% electoral threshold. For the 2007 election, the threshold percentage was not changed, but some amendments to the election process were made. In the 2012 and 2014 elections a mixed voting system was again used (50% under party lists and 50% under simple-majority constituencies) with a 5% election threshold. According to current law, the next election to the Verkhovna Rada will be in 2019. Ukrainian Center for EU Civil Service Standards, public institution established to facilitate administrative reform to European Union standards. ^ "Official website. Administrative and territorial division". March 2017. ^ a b "Ukraine elections: Runners and risks". BBC News Online. 22 May 2014. Archived from the original on 27 May 2014. Retrieved 29 May 2014. ^ started with capitalized letter. Don't confuse with the TRK "Rada" (Ukrainian: ТРК "Рада")- the official TV channel and production studio of the Verkhovna Rada of Ukraine. ^ a b ВР ухвалила закон про вибори народних депутатів [VR adopted law on the election of MPs to parliament] (in Ukrainian). Interfax Ukraine. 18 November 2011. Archived from the original on 8 January 2016. ^ Padokh, Y. "Boyar Council". Encyclopedia of Ukraine. Retrieved 13 October 2007. ^ "General Military Council". Encyclopedia of Ukraine. Retrieved 13 October 2007. ^ Zhukovsky, A. "Central Rada". Encyclopedia of Ukraine. Retrieved 13 October 2007. ^ "Government-in-exile of the Ukrainian National Republic". Encyclopedia of Ukraine. 2008. Retrieved 8 September 2016. ^ a b Subtelny, Orest (2000). Ukraine: A History. University of Toronto Press. pp. s. 576–577. ISBN 0-8020-8390-0. ^ "Verkhovna Rada of Ukraine Resolution On Declaration of Independence of Ukraine". Official website of the Verkhovna Rada. Archived from the original on 30 September 2007. Retrieved 11 October 2007. ^ Law of Ukraine "On Legal Succession of Ukraine"
^ "Constitution of Ukraine". Official website of the Verkhovna Rada. Retrieved 11 October 2007. ^ a b c "Rada Approves Cancellation Of Rule That Bans Deputies From Switching Factions". The Financial. 8 October 2010. Archived from the original on 9 October 2010. ^ a b Mefford, Svitlana. "The Building of Verkhovna Rada. History of the sitting place of Ukrainian Parliament" (184). The Ukrainian Observer. Archived from the original on 27 September 2007. Retrieved 12 October 2007. ^ "Article 85". Wikisource. Retrieved 11 October 2007. ^ "People's deputy of Ukraine VIII convocation Mykola Tomenko". Official portal (in Ukrainian). Verkhovna Rada of Ukraine. Retrieved 9 October 2016. "People's deputy of Ukraine VIII convocation Alena Koshelev". Official portal (in Ukrainian). Verkhovna Rada of Ukraine. Retrieved 9 October 2016. "People's deputy of Ukraine VIII convocation Mykola Tomenko". Official portal (in Ukrainian). Verkhovna Rada of Ukraine. Retrieved 9 October 2016. "Turchynov is summoned for interrogation to SBU today – BYUT". UNIAN. 20 September 2010. Archived from the original on 27 February 2014. Retrieved 7 October 2010. "Batkivschyna to nominate Tymoshenko for presidency, Yatseniuk heads party's political council". Kyiv Post. Interfax-Ukraine. 14 June 2013. Archived from the original on 15 June 2013. Retrieved 14 June 2013. "BYT-Batkivschyna replaces its leader". Kyiv Post. Interfax-Ukraine. 7 December 2011. Archived from the original on 7 December 2011. Retrieved 14 December 2011. ^ Grytsenko, Oksana (21 September 2014). "Allies of Yanukovych trying for parliament". Kyiv Post. Retrieved 8 December 2014. ^ "Article 80". Wikisource. Retrieved 11 October 2007. ^ "Article 81". Wikisource. Retrieved 11 October 2007. ^ "Стаття 79". Ukrainian Wikisource. Retrieved 11 October 2007. ^ "Article 79". Wikisource. Retrieved 11 October 2007. ^ Leaders of The Verkhovna Rada of Ukraine, Official website of the Verkhovna Rada. ^ "Article 88". Wikisource. Retrieved 11 October 2007. ^ "Article 83". Wikisource. Retrieved 11 October 2007. ^ "Article 107". Wikisource. Retrieved 11 October 2007. ^ a b "Article 112". Wikisource. Retrieved 11 October 2007. ^ "Ukraine MPs hurt in parliament brawl". 17 December 2010. Retrieved 16 January 2019. ^ Mellen, Ruby (20 December 2018). "Yet again, a fistfight breaks out in Ukraine's parliament". Washington Post. ^ "BYuT faction blocks parliament's presidium and rostrum". UNIAN. 22 October 2008. "Rada Closes meeting". Ukrainian News Agency. 22 October 2008. Archived from the original on 24 October 2008. "BYT Unblocks Rada". Ukrainian News Agency. 24 October 2008. Archived from the original on 26 October 2008. "Sit-in disrupts Ukraine assembly". BBC News. 29 June 2006. Retrieved 26 August 2006. ^ Protests in Kiev as Ukraine parliament approves Russia fleet treaty. The Hindu. KIEV, 27 April 2010. ^ "Death Toll Rises To Three From Grenade Attack Near Ukrainian Parliament". Rferl.org. AP, Reuters, AFP, Interfax, BBC. 1 September 2015. Retrieved 3 August 2016. "Official website". Verkhovna Rada of Ukraine (in Ukrainian, Russian, and English). "Scheme of seats in the session hall". Verkhovna Rada of Ukraine (in Ukrainian). "Holos Ukrayiny Newspaper". Verkhovna Rada of Ukraine (in Ukrainian and Russian). "Viche Magazine". Verkhovna Rada of Ukraine (in Ukrainian and English). "Regulations of the Verkhovna Rada". Verkhovna Rada of Ukraine (in Ukrainian).